It's tough to find a wetsuit that fits you perfectly. Because of the rather intensive construction process brands typically only offer a handful of sizes, and more often than not you end up settling for the best fit available, but not a perfect fit. This little wetsuit company wants to change that. Carapace Wetsuits, based out of Southern California, has figured out how to make custom-fitted wetsuits for people at normal wetsuit prices. It's kind of the holy grail of manufacturing. Here's how it works. On a website, you are guided with video to take 15 different measurements of your own body. Carapace takes those measurements, applies custom algorithms to them, then puts those numbers into a CAD file, and presto, each panel is the precision cut so when the whole suit comes together it fits all of your body's little freaky weirdnesses just perfectly. Carapace sent me a prototype of their wetsuit to inspect, along with some samples of the neoprene it will be using. The materials are all premium quality, including some super soft/flexible Yamamoto neoprene. The suit is constructed like other high-end wetsuits. All seams are blind-stitched, glued, and taped, making an air-proof seal (I tested it by inflating an arm). It has blast-proof knees, sealed wrists/ankles, a magnetic zipper-stop (very cool), and a stash pocket for your keys. But of course the banner feature here is that it's custom made for your body. With wetsuits, specifically, fit makes a huge difference. 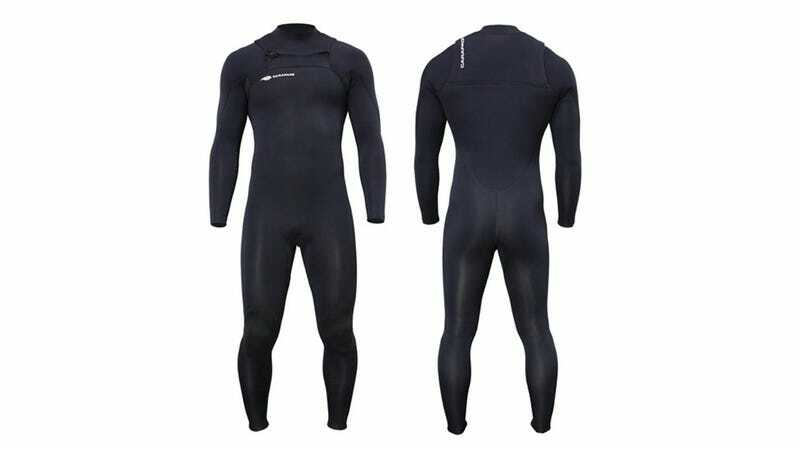 Wetsuits that are too loose allow water to flood in, which is obviously bad. Wetsuits that are too tight have a whole range of problems. If they're tight around the arms or shoulders, the suit acts like a Thera-Band, applying resistance to every stroke you take, which greatly adds to fatigue. The seams also wear out more easily when they're constantly pulled on like that, and when rubber is stretched it doesn't provide as much insulation. With a tailor-made wetsuit, though, you're never stuck awkwardly between sizes. What's more, it's not hard to see how this style of manufacturing could be applied to other things we wear. Shoes would be the ultimate. Most people's feet are two different sizes (mine are almost a full size different), and so they simply buy shoes that are the right size for their bigger foot. Improper fitting footwear can open the door to a whole host of injuries. But what if you could just take some measurements of each of your feet at home, enter them online, and you'd have perfect-fitting shoes every time. It would totally eliminate the guesswork from online shopping. This same concept could be adopted for helmets and pads, baseball mitts, gloves, even running shirts and pants. You could specify if you want them to be tighter in certain areas for compression, and looser in others for breathability. It might sound like overkill, but remember, the Carapace guys are managing to do it for the same price as a normal wetsuit. Cost being equal, wouldn't you rather wear something that fits you perfectly? Carapace Wetsuits are in their final days of a Kickstarter campaign, and they are already right on the verge of making their goal. The suits are 3/2s (three millimeter in the thicker parts, 2 millimeter in the thinner parts), but you can get 4/3 if you pay $20 more, which is a steal. The EXO2 "Performance Suit" is currently going for $380, with materials comparable to Xcel Drylock suits. Their top of the line EXO1 is going for $480, which uses the Japanese Yamamoto neoprene (used in suits like Matuse and Isurus), which has an incredible weight-to-warmth ratio. Not cheap, to be sure, but comparable to what you'd pay for a big brand's high-end line. I inspected the materials for both, and they looked good. Assuming all goes well—this is Kickstarter, after all, so take your block of salt—the suits should ship in the fall, just in time for chilly waters. The only big ding against them is that they haven't cracked the algorithms for women's suits yet, but they said that's coming soon (women can try to use the system, but it's possible the hips won't scale correctly yet).